Most people picture divorce to be an all-out battle between spouses, fought in court in front of a judge or jury, fueled by aggressive divorce attorneys. While going to court is one way of resolving issues pertaining to a divorce, it is not the only way to settle matters between spouses. Alternative Dispute Resolution, commonly known as ADR, is a popular way, where couples resort to any means of resolving disputes outside of the courtroom. Due to increasing court queues, time delays, and rising costs of litigation, more people are opting for ADR to keep the costs and hassle to a bare minimum. Mediation refers to the process where both spouses hire a neutral third party, known as a mediator, to facilitate their negotiations on different divorce matters to avoid going to trail. This method is a great option for people who prefer going through a more non-adversarial and informal process. 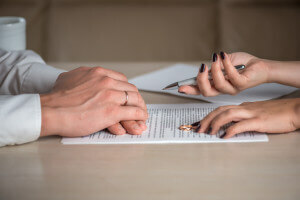 The process begins with both spouses giving information regarding their marriage, issues and disputes, and what they want to achieve through divorce. It is essential for both parties to be prepared to elucidate their goals to the mediator in order to complete the process as smoothly as possible. One of the benefits of mediation is that it is less expensive. This is primarily because there are no attorneys or court involved in the proceedings, eliminating their costs. In most cases, the mediator is the only person involved in the process. Moreover, since the case is not resolved in open court, no public record of statements during the proceedings is maintained, allowing discussions regarding children, assets, and other matters to remain confidential. Arbitration is like a private trial in which a couple hires a third party, known as the arbitrator, to serve as a private judge. This individual is not connected or otherwise has any personal interest in either party, and gives a completely neutral judgment for every issue. During the process, both spouses are required to present their arguments pertaining to different issues, and the final decision is made by the arbitrator, just as a judge would make in a family court proceeding. Arbitration has gained ground over the years, because of its cost-effectiveness and ability to resolve case in a timely manner as compared to traditional family courts. However, it is important to note that all decisions made by an arbitrator during the process are binding on both parties. This means that the couple cannot make an appeal to a higher court for matters they don’t agree with. This ADR method refers to the process in which both spouses negotiate the terms of their divorce in the presence of their attorneys in a cooperative manner. Generally, negotiations are carried out in a four-way meeting, where discussions are non-adversarial in nature. Collaboration is a great choice for divorcing spouses who want to avoid formal court proceedings, but need the legal counsel of an attorney in all aspects of the divorce process. For more information on any of the ADR methods and whether it is the right choice in your situation, contact Keller Legal Services today at 630-868-3093 for a free initial consultation.